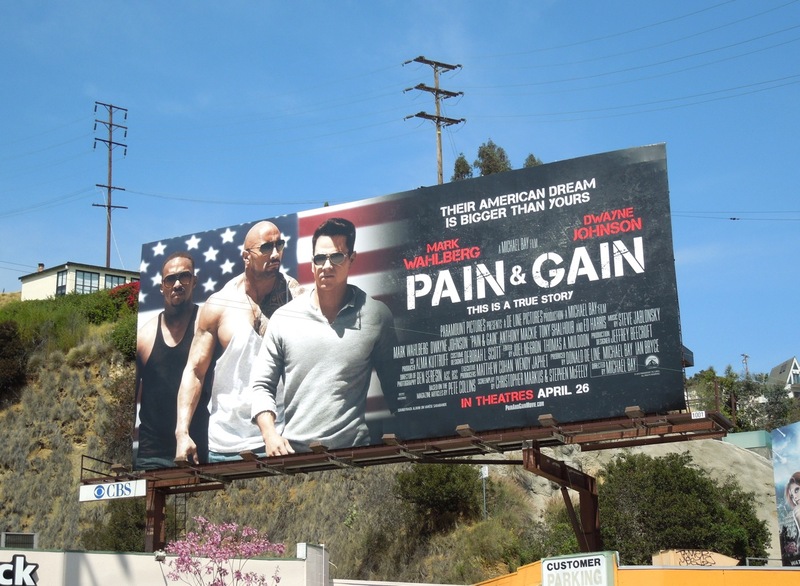 Pain & Gain is the new crime action comedy from Michael Bay, based on the true story of a trio of Miami bodybuilders who hatch a kidnap and extortion scheme which goes disastrously wrong. 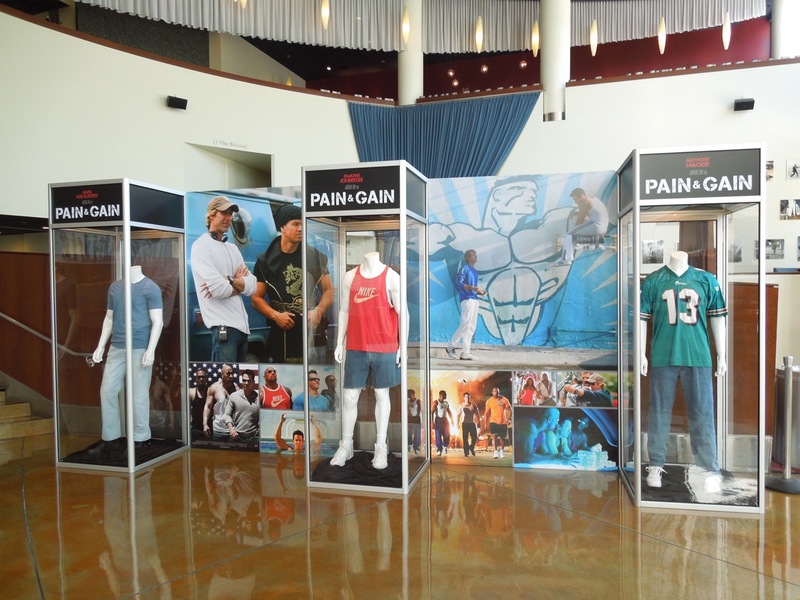 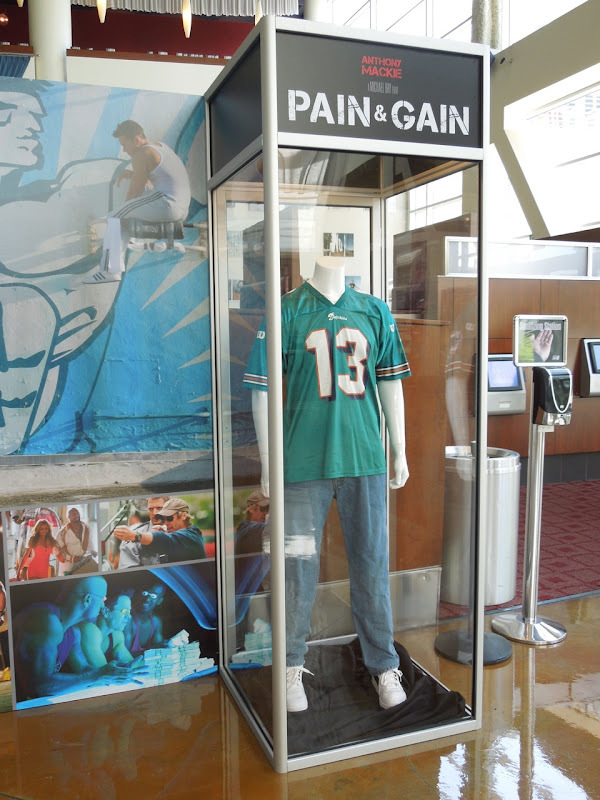 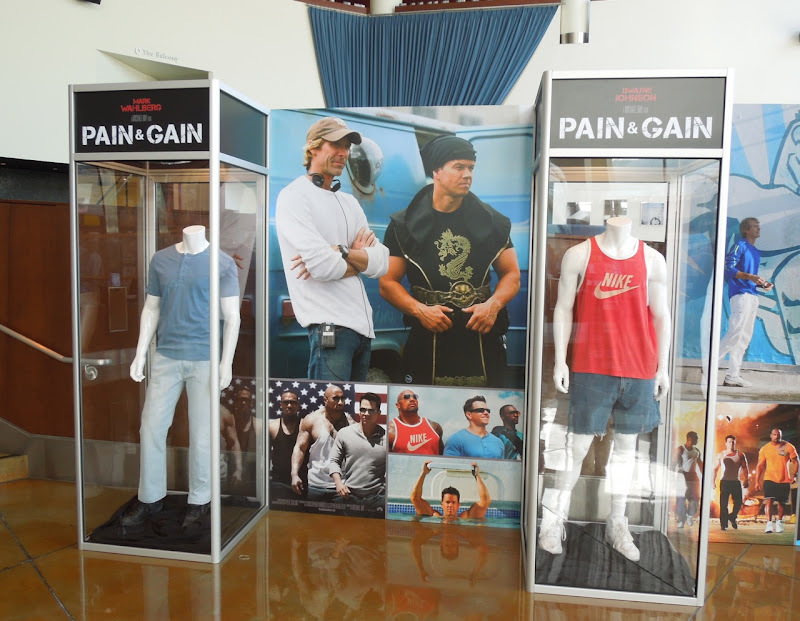 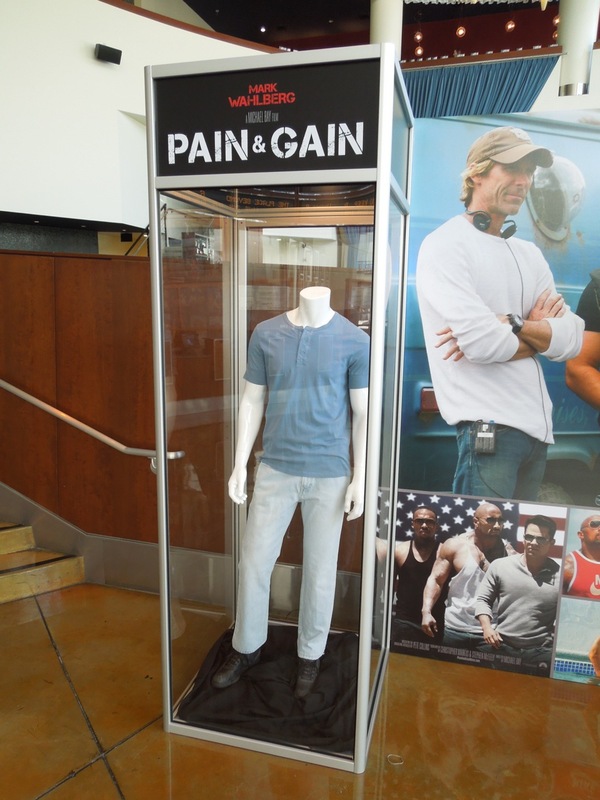 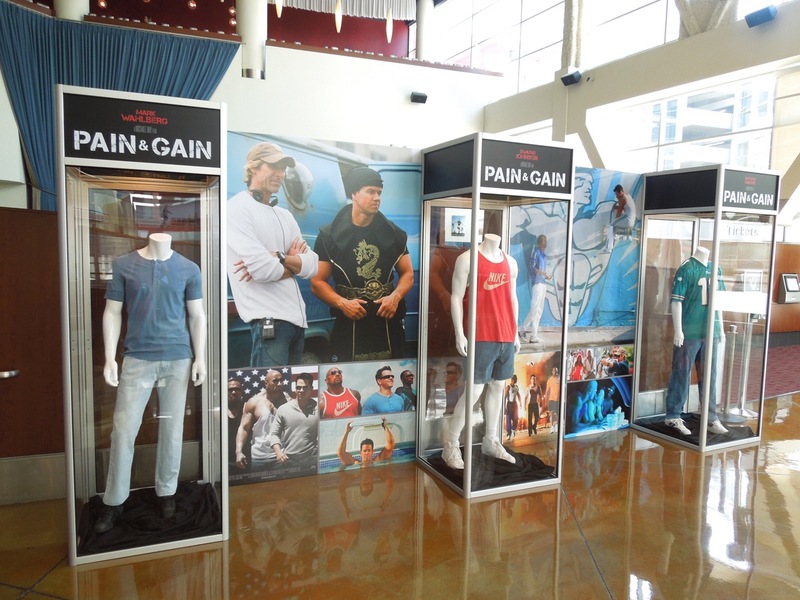 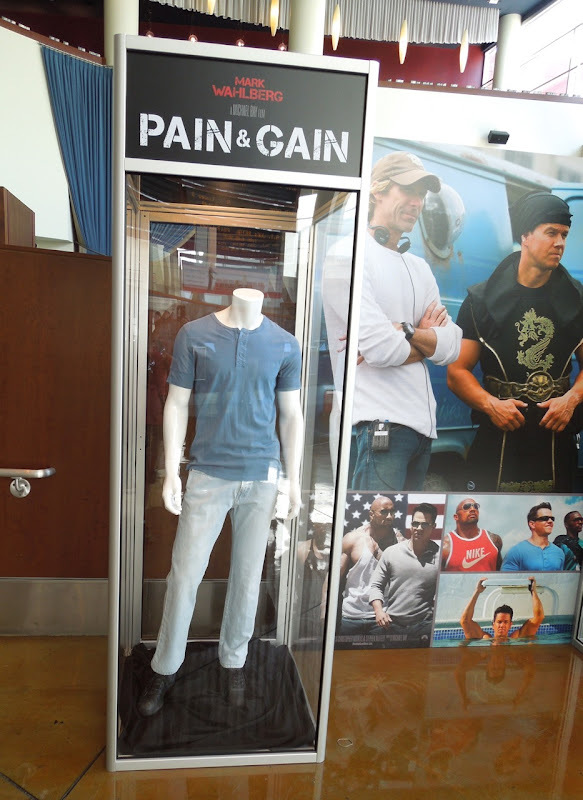 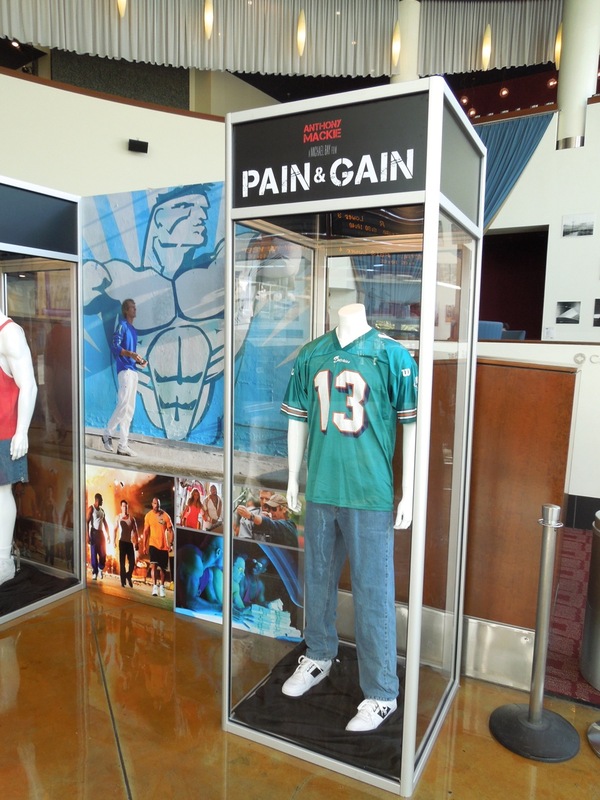 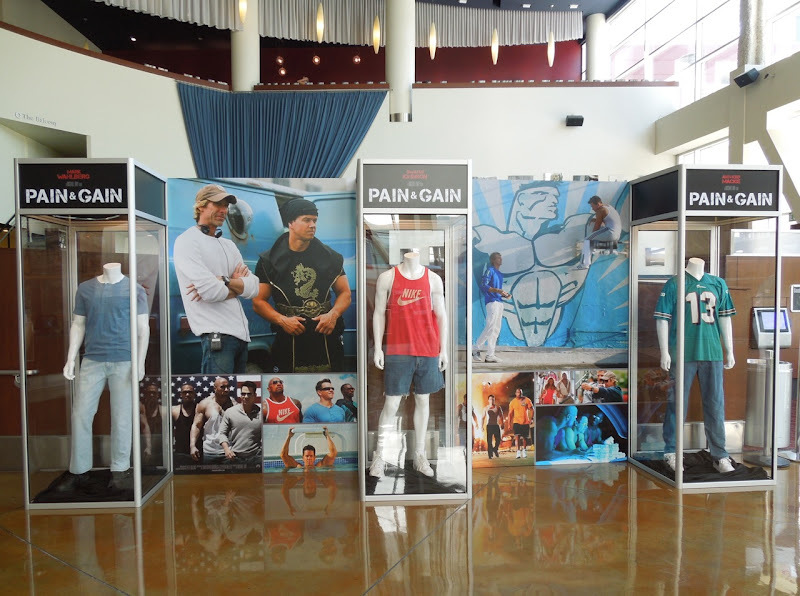 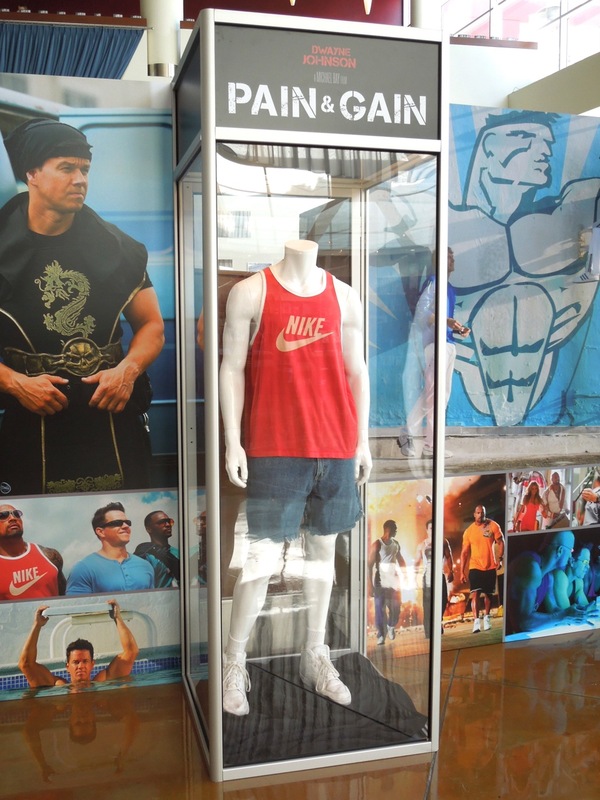 Deborah Lynn Scott and Colleen Kelsall were responsible for costume design on the movie and this exhibit of outfits worn by the lead actors in Pain & Gain were photographed on display in ArcLight Hollywood cinema's foyer on April 11, 2013 (although they probably could have done with even more muscular mannequins). 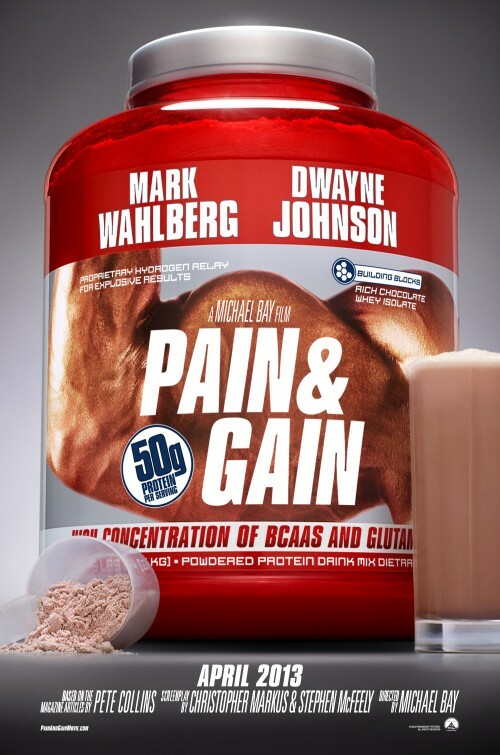 In the movie 'Daniel Lugo' (Mark Wahlberg) and his bodybuilder pal 'Adrian Doorbal' (Anthony Mackie), who workout at the Sun Gym, are sick of being poor and come up with a plan to kidnap and steal the fortune of a spoiled, rich business man at their gym. The pair enlist the help of recently released convict 'Paul Doyle' (Dwayne Johnson) to help with their murder extortion scheme, but their target survives their botched attempt and the 'Sun Gym Gang' ends up pursued by the police and a private investigator. 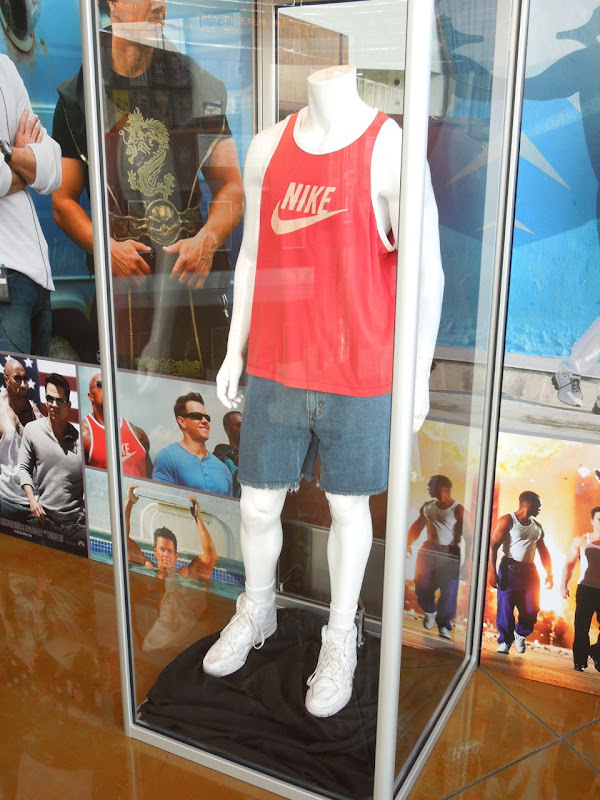 If you're a fan of the pro-wrestling's The Rock, be sure to also check out Dwayne Johnson's movie costume from Fast Five on display. 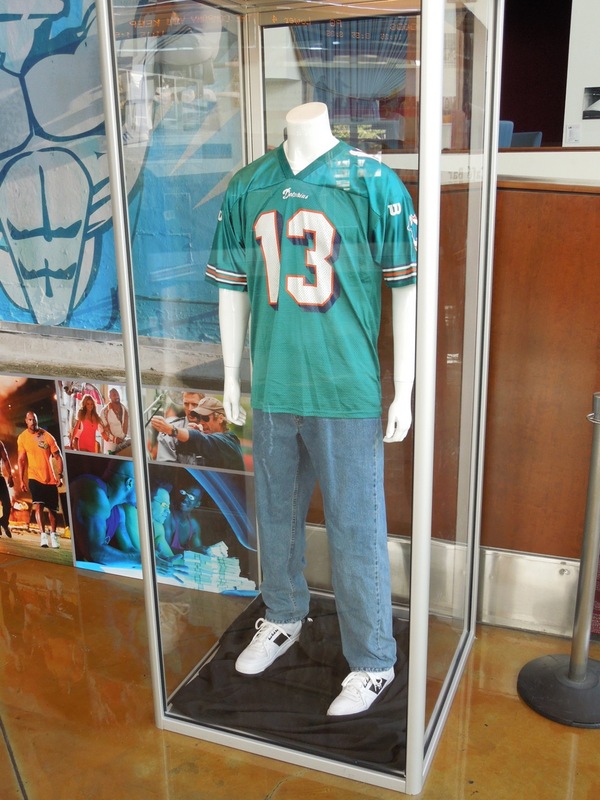 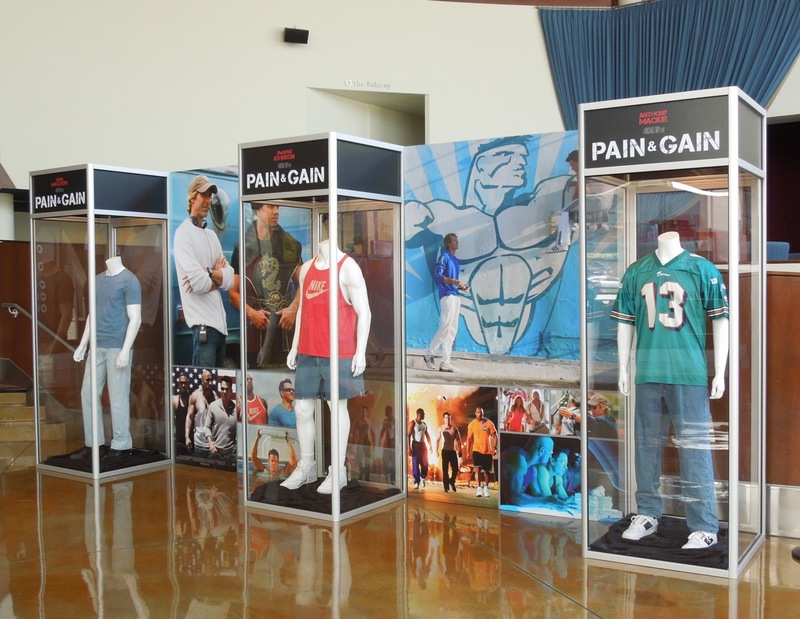 Look for these costumes on the big screen when the pumped up movie opens in the U.S. at the end of April 2013.
what the shoose under tge red tshirt?